Really simple DMX input & output from your Mac, via Art-Net. Generates MIDI messages for you, without having a hardware controller. Great for testing and experimenting! Hate giving demos in mirrored-displays mode? Use Presenter Mirror while in dual display mode to see what’s on the projector screen behind you! Keeps your main display free for notes and preparation, while you can present on the secondary display. 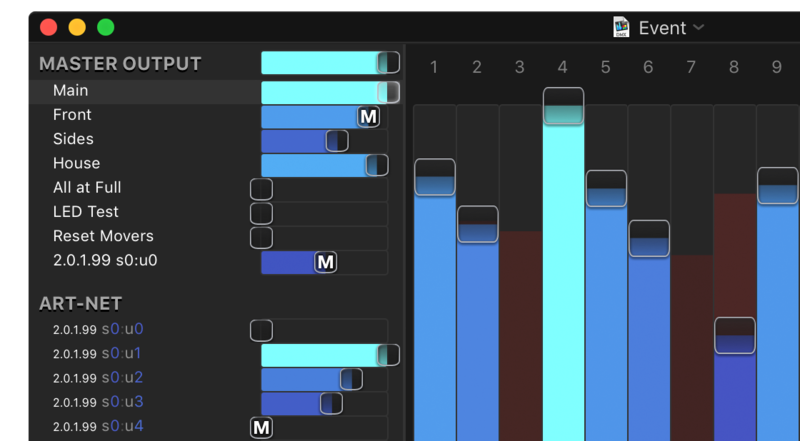 iOS MIDI controller with simple sliders that are always smooth. Connects via WiFi to OS X. Easily map MIDI and OSC messages to Vista Spdyer UDP commands. Configurable via a web interface. Runs on a minimal Linux box, or OS X.